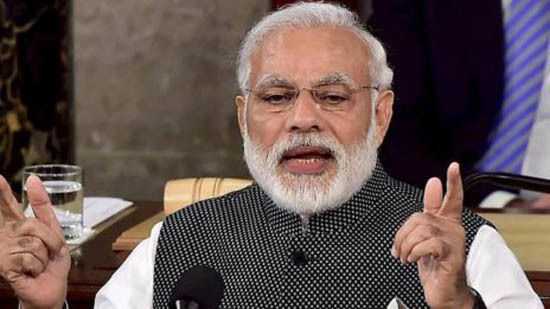 Jagdalpur, Nov 9: Placing the Congress in the cross-hairs for allegedly standing in unison with ‘urban Naxals’, Prime Minister Narendra Modi today said that problems could not be resolved through bombs and guns but through democracy. Mr Modi made the statement while addressing a public meeting in the support of Bharatiya Janata Party (BJP) candidates in the Bastar Region. “Under the pretext of Naxalism, certain people with demonic tendencies handed guns to those who should have been wielding pen. Those who set ablaze schools, damage hospitals and obstruct development are engaging in demonic acts,” he said. “Maoists kill innocent men, but Congress leaders describe them as revolutionaries. It is their character. The Congress has no future, and it is trying to search for ground through lies,” he said. Recalling that several tribal men had been gunned down in Bastar in 1966, the Prime Minister stressed on the need for teaching the Congress a lesson. On the occasion, he also remembered security personnel martyred and a Doordarshan camera-person who was killed in a recent Maoist encounter.